Joe’s Cozy Corner is long shuttered. On January 31st 2017, Todd Price at the Times-Pic reported that the former Joe’s Cozy Corner in Treme is set to become a new Turkish cafe with Fatma Aydin on the range. Our morning constitutional regularly takes us by an Upper 9th Ward home with a big fancy sign for Joe’s Cozy Corner in the yard, and we’ve always marveled at the whimsy. On January 18th of 2004, Richard Gullette, a double amputee, was hawking beer on the street directly across from Joe’s Cozy Corner at the intersection of Ursuline and North Robertson. Treme was bustling as the funeral procession for Tuba Fats had just rolled nearby. 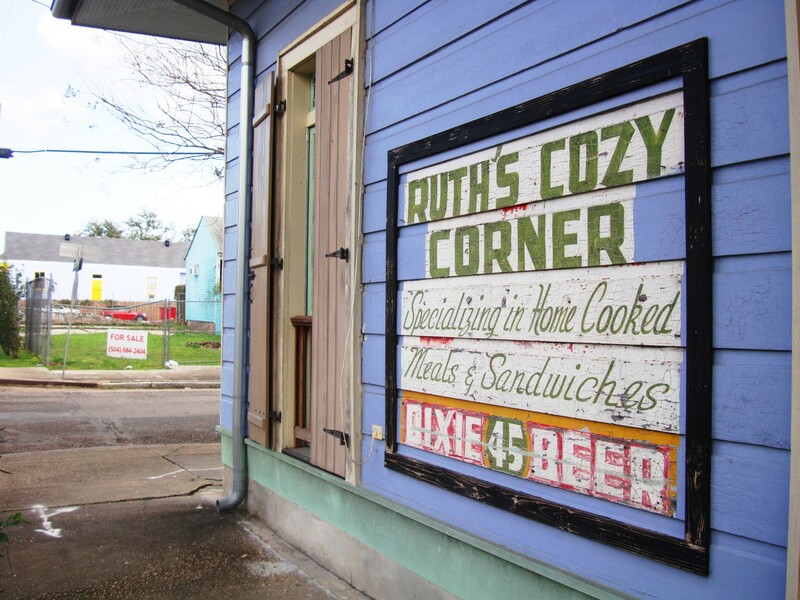 Joe’s Cozy Corner was no stranger to the violence that has plagued New Orleans for centuries. On June 30, 2000, Marlin Lawson was killed as he left the bar, and on December 29, 2002, Mark Cerf, a spyboy for the Yellow Pochahontas Mardi Gras Indians, was killed inside during a jazz show. Papa Joe Glasper (b.February 4, 1941) proprietor of Joe’s Cozy Corner since 1992, left a bar filled with patrons to walk across the street and confront Gullette. The scene was an ugly one with Gullette saying “get back in the bar where you belong, old man.” Glasper walked back into his bar, tucked a pistol in his waistband and walked back outside to continue the beef. Gullette punched Glasper in the head. Glasper responding by pulling the gun, and shooting and killing Gullette. A jury convicted Glasper of manslaughter, he died in jail while awaiting sentencing. He was 64. Feel like falling down a rabbit hole? We spent three days writing this article. Here are some research portals.